The Richard H. Hungerford School will relocate from its 155 Tompkins Ave. space into a new, 300-seat building inside the Petrides Campus. SUNNYSIDE — A special education school will move from its Clifton home into a new, 300-seat building with elevators and wheelchair ramps inside the Michael J. Petrides campus, officials announced Wednesday. The Department of Education will build a new spot for the Richard H. Hungerford School to better accommodate students with disabilities and give them access to Petrides' gym, sports fields and more. "This new building is a part of our work to ensure equity and excellence for all students," schools Chancellor Carmen Fariña said in a statement. "We’re committed to providing every student with a school where they have the resources and support they need to succeed, and the new state-of-the-art Hungerford School will be a remarkable asset to District 75 students, families and teachers." The new building will have Braille signage in every room and hearing loops — wire that circles rooms connected to a sound system that students with hearing aids or cochlear implants can tap into — the DOE said. The city expects to start the design for the new building in the fall and finish construction for the start of the 2012-2022 school year. The Hungerford School, which celebrated its 50th anniversary this year, currently serves more than 400 students with disabilities in grades 6 to 12 from its main building and several annexes. Its main site, at 155 Tompkins Ave., currently serves about 230 students. The school also runs a work-study program for students ages 17 to 21, and plans to continue use of its inclusion sites and annexes, the DOE said. The new building will be built on space previously used by the College of Staten Island that was owned by the state, but it was officially transferred to the DOE this summer, officials said. 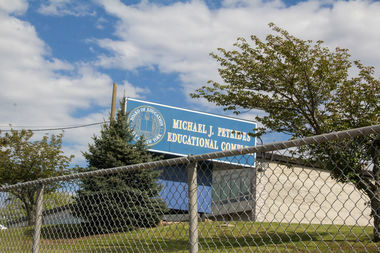 The 43-acre Petrides campus, at 715 Ocean Terrace, currently houses a pre-K through 12th grade school along with DOE administrative offices.